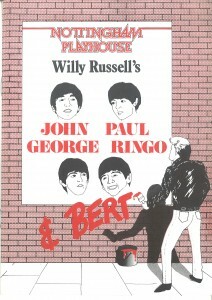 Programme from a 1979 production of ‘John, Paul, George, Ringo & Bert’ written by Willy Russell and performed at the Nottingham Playhouse. Click the link below to see the full programme. In the early 1960’s I was a very young teenager and a huge fan of The Beatles. It seemed to be the trend that you were into either ‘The Beatles’ or ‘The Rolling Stones’, but didn’t generally admit to liking both. Aside from the music, I think a lot depended on which member of the group you happened to fancy, so that played a big part in which one you followed. Paul was my favourite, with George a close second. I saw the The Beatles when they appeared live on stage at the Nottingham Odeon Cinema, after applying by post for tickets. As I remember, it was just pot luck as to whether you were successful or not, but on this occasion my best friend was the lucky one so I got to go along too! However, the tickets were on the back row and although we could just about see the stage, it was impossible to hear anything because of the constant screaming. No matter, the fact that we could lay claim to ‘being there’ was enough and I can still picture the famous 4 in their grey collarless suits in my mind’s eye today. When I was 16 (1968) I took a job as a Saturday girl in a dress shop in Nottingham. Everyone wanted to work in the trendy new independent boutiques of the time, but unfortunately this was one geared to the more mature lady. The main thing was to earn some pocket money. The pay for the day was one pound (pre-decimalisation) less a few pence National Insurance, but easily enough for a night out. This covered bus fare both ways, admission to a disco and one drink of cider and blackcurrant. Anything left was saved up either to buy an item of clothing from ‘Chelsea Girl’ or maybe some makeup from the ‘Biba’ counter. Note: In 1979, Audrey reprised her trip to see the Beatles when she went to Nottingham Playhouse to watch Willy Russell’s play ‘John, Paul, George, Ringo and Bert’ – voted ‘Best Musical of 1974’. You can see a copy of her programme here. She went to the Playhouse again the same year to see ‘Teeth ‘n’ Smiles’, a musical play about the sixties written by David Hare. Find out more about the last of the Beatle’s three performances in Nottingham. Read an article about interpreting the Beatles by Loughborough historian Marcus Collins.